Nominal input voltage options are 24V and 48V, with respective input ranges of 18V-36V and 36V-72V. 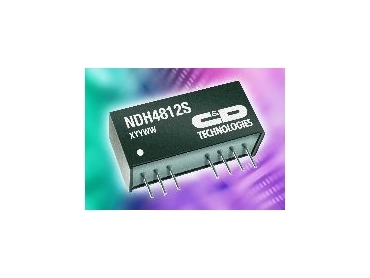 C&D Technologies, represented in Australia by Adilam , has released dual-output dc/dc converters with high power density and integrated protection. They save space and reduce component count. The 3W devices come in miniature SIP packaging. The NDH series offers high levels of integrated functionality to minimise external components and simplify circuit layout. The converters have a 2:1 input voltage range to allow maximum design flexibility, with outputs regulated to 0.5%. Nominal input voltage options are 24V and 48V, with respective input ranges of 18V-36V and 36V-72V. Dual output voltage options are 12V and 15V for each nominal input voltage. In all cases, isolation between the input and outputs is rated at 1kV dc. Typical line and load regulation are rated at 0.15% and 0.2% respectively. Continuous short circuit protection with current foldback is integrated. The converters are supplied in fully encapsulated, UL 94V-0-compliant SIP packages measuring 26.95mm x 9.25mm x 12.45mm. They have a power density of 1.05W/cm3. The devices can deliver their full 3W output power at temperatures from -40ºC to 85ºC without the need for a heatsink or other additional cooling. All devices in the NDH family combine SMD construction with ceramic capacitors, a ceramic substrate and a tough chip and wire-bonded MOSFET power transistor die to ensure maximum operating life.